The neighbors were somewhat scarce when the young Frank R. Whitman homesteaded on section 18 in Lake Williams township in may, 1905. He was born in Pelican Rapids, Minnesota April 26, 1882, the son of Emerson and Blanche Quiggle Whitman. 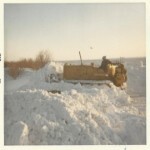 Prior to homesteading in North Dakota, Frank had farmed a couple of years in Minnesota, homesteaded in Canada, then owned and operated a dray line in Pelican Rapids, Minnesota. While Frank built his homestead shack, he stayed with Tom Price at the sheep ranch along with other neighbors: Tom Wilson, John Wick and John’s sons, Jim and Carl. He walked back and forth morning and night. 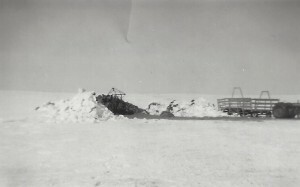 All materials had to come from Dawson, since the town of Robinson, four miles from the ranch, had not yet been established. In the spring of 1906, after selling his dray line, Frank shipped his livestock and belongings to Dawson and brought them to his homestead. In 1912 Frank became better acquainted with Marion Russ of Tuttle, the daughter of E.E. Russ. She was a schoolteacher in Lake Williams Township. 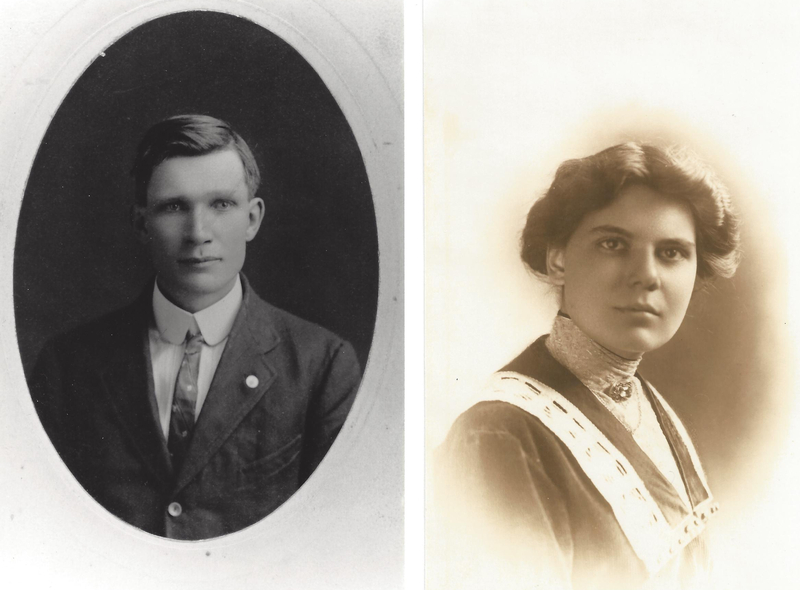 They were married in April 1913. To this union were born six sons: Glen, Allan, Harold, Frank Jr, Ward, and Paul. In 1915 Frank bought a Case 80 threshing rig and for many years threshed not only his own crop but spent the fall threshing for neighbors. By 1922 Frank had acquired other parcels of land beside his homestead and decided a better location for his farmstead would be on the southwest corner of section seven, where it is located at the present time. He had secured a good well on section 7, whereas he had not found a good water source on section 18. At the new location, other buildings were added beside the house which was moved from the homestead. The livery barn from Robinson was purchased and moved to the farm when it was no longer in use in Robinson. Moving the barn from Robinson to the ranch. 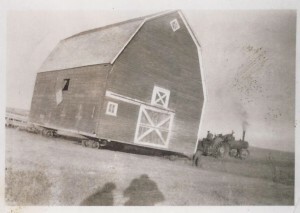 The barn is still in use today. It was fitted as a milking barn, and a lean-to was added to it. This hip-roofed barn is still in use today. Corrals and other barns were added. 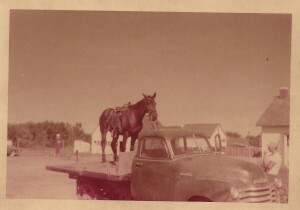 In the hard years of the 1930s, Frank bought and sold horses, traveling with them to other states while Marion and the older boys kept up with the farm work. 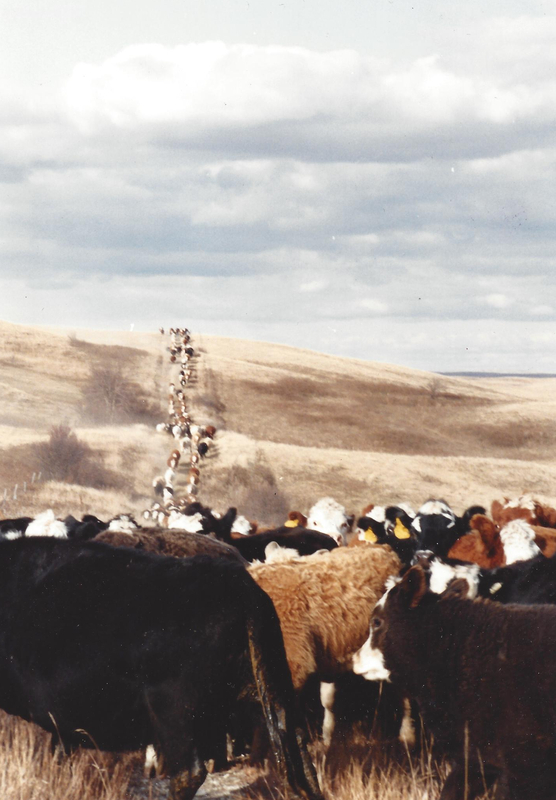 A herd of registered Hereford cattle were also an integral part of the operation. 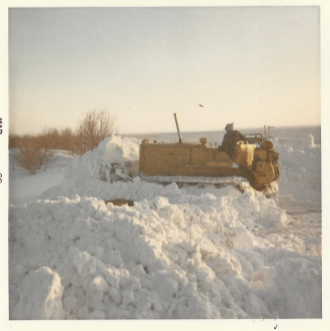 Moving snow after the blizzard of ’66. In the 1940s, Glen, Allan and Ward turned to aviation as a tool to speed some of the work, so an airport was added. Frank and Paul also took up flying. Marion had raised the six boys and had taken care of all comers to the farm, beside raising poultry and large gardens. Frank’s parents, Emerson and Blanche, came to North Dakota to live eventually, and when Blanche became ill, Marion took care of her until her death. Marion was a respected and active member in the church and community. In 1949 she passed away due to complications after surgery. Glen and Ward, having flown to visit Allen. By this time, Glen, Allan, Frank and Harold were established on their own places and Ward was managing the farm with his father’s council and support. Paul also helped with the farming in between college years and for a short while after returning from serving in the U.S. Air Force, having served the majority of the time in Great Britain. Paul soon opted to pursue further education. In 1951, Ward married Edith Mahin, an elementary teacher from Tappen, ND. 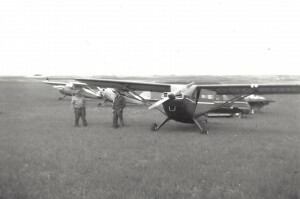 They continued the farming operation, and Ward continued to use an airplane, especially in the livestock part of the operation, since it was a practical way to check on several scattered pastures in a short amount of time each day. 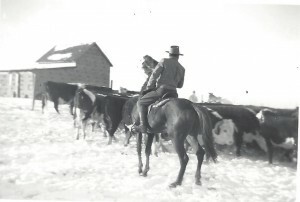 Feeding cattle after a blizzard. Spraying crops by air was also a large part of the aviation program. A Cessna 210 was added and became an efficient means of travel across the United States, Canada, and off shore islands. Five daughters were born to Edith and Ward: Anne, Shell, Kay, Sharon and Lynne. As they grew, they contributed their help, and learned to like the farm life. Glen with cattle in the yard. As time went on, Ward acquired land and invested in the home ranch. He introduced practices such as tree planting, strip cropping and eliminating large growths of offending weeds, following the recommendations given after research in these areas. These all improved soil and preserved pastures. In 1968 the Kidder County Soil Conservation award was given to Ward, Edith and daughters. 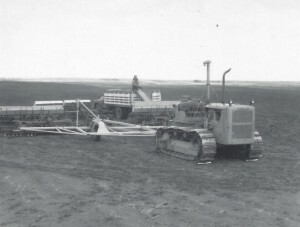 48-foot planter developed on a frame built by Ward, circa 1950s. When ward required major surgery in the spring of 1997, daughter Anne came daily from the Ongstad farm in the Fessenden area to check cattle calving in the pastures, with Ward’s Cessna airplane. That fall Anne joined the operation full time as managing partner and began to invest in the ranch. Bringing cattle home in the fall. Anne, Ward and Edith formed a legal partnership taking “Whitman Ranch” as the official name of the business. Anne has continued in Ward’s way of adding practices (such as organic farming) that enhanced the land and make the operation more profitable. She also established the practice of raising and finishing natural beef. In 2009 she was awarded the Kidder County Soil Conservation District’s achievement award acknowledging these practices. There have been some good years and difficult years, but in the one-hundred-plus years since Frank Whitman Senior homesteaded in Kidder County, there have been very few thoughts of ever giving up on learning more and trying harder. The friends and neighbors, and the sharing of both good times and sad with great faith and optimism have surely made this home! Copyright © 2019 WHITMAN RANCH. All Rights Reserved. The Matheson Theme by bavotasan.com.